Genetic counselors’ advanced training in – you guessed it – genetics and counseling, plays a key role in healthcare. Genetic counselors can guide and support people seeking more information about how inherited diseases and conditions might affect them or their families, and help interpret test results. While many genetic counselors work directly with patients, others focus on research to help in the development of new or improved treatment or care for people with genetic conditions. In honor of Genetic Counselor Awareness Day on Nov. 8, National Society of Genetic Counselors (NSGC) members Heather A. Zierhut, PhD, MS, CGC, and Adam H. Buchanan, MS, MPH, LGC, share how their research is shaping the future of genetic counseling and precision medicine. NSGC: What inspired you to be a genetic counselor? Heather: I think there are two main categories of people who become genetic counselors: those who have a long exploration into the profession or those who have a light bulb moment. My entrance into genetic counseling was like a laser light show. My undergraduate genetics professor briefly mentioned the career. Like any good researcher, I went to my tiny matchbook size dorm room and looked up everything I could possibly find on the topic. Fireworks were going off in my mind. Genetic counseling was love at first literature search. Adam: I’m one of those long exploration types. In college I cycled through several possible career choices. My career research was a great source of stories about the (sometimes gross) lives of a veterinary technician or hospital employee who cleans up after surgeries. But, nothing grabbed me until I worked with a genetic counselor while doing my thesis in a master’s of public health program. I loved the way genetic counseling combined the communication skills I was learning as a public health educator with the connections you make while interacting with patients. NSGC: How did you first get involved in genetic counseling research? Heather: Like many aspiring Principal Investigators, my gateway to research was undergraduate summer programs. I loved the idea of being able to set up experiments, ask questions, and get answers all in a three-month time span. But after experimenting in yeast and fruit fly labs, I found myself wanting to research something different. I switched gears to my ultimate organism of interest, humans. It all started with two genetics icons, Janet and Marc Williams, giving me a small research project looking at outcomes of early hearing screening tests. Even after making the decision to pursue genetic counseling, I never lost my desire for research. I searched for a training program where I could find mentors to support my interest in clinical care and research. The desire for research mentors was first and foremost in my decision to go to the University of Minnesota. Adam: When my kids were little and their favorite question was “why?”, I knew they came by it honestly – it’s always been one of my favorite questions, too. As a genetic counselor I sought out ways to answer the whys that arose in my clinical work. Like Heather, I was fortunate to have colleagues willing to indulge those questions and a mentor who looked for opportunities to involve me in all phases of research during my research apprenticeship – including writing and reviewing manuscripts and learning the ins and outs of grant proposal preparation. So, when I was driving home from a rural cancer genetics clinic one day and had a light bulb moment about how to more efficiently improve access to care, I had the tools to turn that spark into a viable research project. NSGC: What do you enjoy about genetic counseling research? Heather: You either love and appreciate the ups and downs of research or you gut out the experimentation period in hope and anticipation of the day you get those final results. As much as I wish I could say that I love to stop and smell the research roses, I do not. I am a destination data person. Getting results is my favorite part of research. It’s like the best holidays all wrapped into one called Data Day. Knowing this about myself, I chose to pursue a doctoral degree in genetics and epidemiology with research projects that give me data sooner rather than later. Adam: I’m totally with Heather on her love of Data Day. I also love thinking about the research process as crafting a story. If everything falls into place, you develop this beautiful narrative that arcs from why your research topic is important to patients all the way to how the study you’ve proposed will generate data that will help those patients. It’s a challenging process that takes a lot of tinkering and being able to communicate the big picture while having your details in order. That’s why it’s such great fun when it works. NSGC: What advice do you have for aspiring genetic counseling researchers? Heather: I shifted research directions completely after completing my PhD. The shift was the right direction for my newly developed skill set, but I needed help getting started. I reached out to people with expertise and asked them to assist me. I applied for numerous early investigator grants and was told repeatedly that I needed more experience in the field. Not letting it slow me down too much, I started collecting pilot data to build my case. Others in the field started to take notice and I was asked to be on several national committees. These combined efforts led to funding through the Jane Engelberg Memorial Fellowship, a grant intended to promote the professional development of individual counselors and to improve the practice of genetic counseling. This took persistence and a following a slightly different path than I had envisioned. My advice is don’t be afraid to take risks and get out of your comfort zone. Adam: All research starts with a good idea. And our clinical experience can provide a wealth of research ideas. Pay attention to the whys that linger in your mind after seeing patients. Also, researchers fail. Sometimes spectacularly – unfunded grant proposals, rejected manuscripts, and studies that go off the rails. This is a particular challenge for the over-achievers who make up the ranks of genetics professionals. But, it’s an inevitable part of doing research that moves the field forward. Keep your head up, rely on the mentors Heather mentioned – they’re out there and they really do want to help – and learn from everything. Finally, find a research focus that gets you jazzed. It’s a lot easier to be persistent when you’re excited about your work. NSGC: What genetic counseling research are you working on now? Heather: My current research is on the vast under-diagnosis of familial hypercholesterolemia (FH) and issues that arise in communication of genetic information in FH families. There are 1 in 250 people out there with a treatable genetic cause of high cholesterol. It’s my research and my job to make sure that people with FH know the risks and have opportunities to prevent heart disease in their families. But as with anything having to do with families and communication, it’s complex. Our research team chips away at finding ways to screen families and help them become aware of their heart disease risks. We hope to give an opportunity to end the cycle of heart disease in their family. Adam: I’m leading a group that was just funded by the NIH to study how children and their parents react to receiving genomic results for conditions that do not occur until adulthood (such as hereditary breast and ovarian cancer syndrome). There are lots of intriguing questions we’re hoping to answer in this study, particularly about the psychosocial impact of this information and how family members use it to guide their healthcare. It’s a topic that has been written about a bunch, but there’s barely any empirical data to guide whether and how to provide this information to families in practice. We’re looking forward to adding our story to the mix and helping families in the process. Heather Zierhut is the associate director of the University of Minnesota Graduate Program of Study in Genetic Counseling and assistant professor in Genetics, Cell Biology, and Development. Current areas of research include the psychosocial and public implications involved with the provision of genetic counseling services, implementations of whole genome sequencing, and outcomes of genetic counseling. Adam Buchanan is an assistant professor in the Genomic Medicine Institute at Geisinger, Co-Director of the MyCode Genomic Screening and Counseling program, and a member of the American Board of Genetic Counseling. His research focuses on access to genetic counseling and assessing behavioral and psychosocial outcomes of genetic counseling. As we observe the first annual Genetic Counselor Awareness Day on Nov. 9, I can’t help but be astonished by the changes in our profession and how they are shaping, and being shaped by, the exciting advances in how we diagnose and treat genetically-influenced conditions. As President-Elect of the National Society of Genetic Counselors (NSGC), I have never been more proud or excited to declare “I am a genetic counselor!” and share how we bring the voice of patients and clinicians to all areas and applications of genomics. When I completed my genetic counseling training in 2001, I couldn’t have predicted that I would find myself working on the leading edge of clinical genomics. When I began working at a genomics biotechnology company in 2012, I was only the second genetic counselor on staff. According to the 2012 NSGC Professional Status Survey (PSS), a mere 0.5% of our profession was employed by R&D or biotechnology companies. Four years later, the 2016 PSS showed this had doubled. Today, there are 17 genetic counselors at my company, working collaboratively with scientists, bioinformaticians, developers and executives, contributing our skills and expertise to areas such as medical affairs, market development, product marketing and strategic planning, and sharing the real-world impact that their work ultimately has on patients and their families. Mine is just one example of genetic counselors’ expanding roles. We are leading patient-centered original research and are integral to Geisinger’s MyCode study, The Ohio State University’s Statewide Colon Cancer Initiative and All of Us, to name just a few. We are driving growth and change in clinic by branching into specialty areas including neurogenetics and psychiatric genetics. NSGC surveys tell the story: In the 10 years leading up to 2016, the number of specialty areas where genetic counselors work went from 14 to 33, a 135% increase. Vast and exciting career opportunities are fantastic for the genetic counseling profession and ensure a bright future for those entering our field. But as good as this trend is for our profession and the 4,000 certified genetic counselors in the U.S., the benefits are even greater for other genomics professionals and, critically, to patients. Genetic counselors have deep scientific and medical knowledge. Paired with our communications and counseling skills, we are a valuable resource in translating research advances in genetics and genomics to healthcare providers and patients. As media coverage of these advances expands, providers and patients often have questions about how these new discoveries impact their care. We unravel the complexities of research so that clinicians and patients receive clear, accurate and digestible information, regardless of their culture or background. So, here’s to Genetic Counselor Awareness Day! Working together to improve appreciation and understanding of how we and our partners in genomics empower patients and their healthcare team and provide them with ever improving personalized attention and care. Erica Ramos, MS, CGC, is President-Elect of the National Society of Genetic Counselors (NSGC). 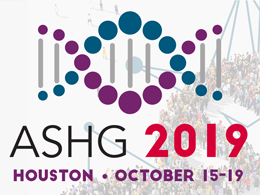 She has been a member of ASHG since 2014.